Ludwig van Beethoven ( i/ˈlʊdvɪɡ væn ˈbeɪˌtoʊvən/, /ˈbeɪtˌhoʊvən/; German: [ˈluːtvɪç fan ˈbeːtˌhoˑfn̩] ( listen); baptised 17 December 1770 – 26 March 1827) was a German composer and pianist. A crucial figure in the transition between the Classical and Romantic eras in Western art music, he remains one of the most famous and influential of all composers. His best-known compositions include 9 symphonies, 5 piano concertos, 1 violin concerto, 32 piano sonatas, 16 string quartets, his great Mass the Missa solemnis, and one opera, Fidelio. Born in Bonn, then the capital of the Electorate of Cologne and part of the Holy Roman Empire, Beethoven displayed his musical talents at an early age and was taught by his father Johann van Beethoven and by composer and conductor Christian Gottlob Neefe. At the age of 21 he moved to Vienna, where he began studying composition with Joseph Haydn, and gained a reputation as a virtuoso pianist. He lived in Vienna until his death. By his late 20s his hearing began to deteriorate, and by the last decade of his life he was almost completely deaf. In 1811 he gave up conducting and performing in public but continued to compose; many of his most admired works come from these last 15 years of his life. 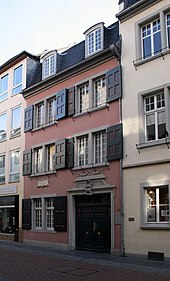 Beethoven was born of this marriage in Bonn. There is no authentic record of the date of his birth; however, the registry of his baptism, in a Catholic service at the Parish of St. Regius on 17 December 1770, survives. 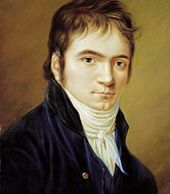 As children of that era were traditionally baptised the day after birth in the Catholic Rhine country, and it is known that Beethoven's family and his teacher Johann Albrechtsberger celebrated his birthday on 16 December, most scholars accept 16 December 1770 as Beethoven's date of birth. Of the seven children born to Johann van Beethoven, only Ludwig, the second-born, and two younger brothers survived infancy. 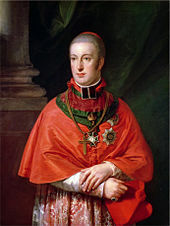 Caspar Anton Carl was born on 8 April 1774, and Nikolaus Johann, the youngest, was born on 2 October 1776. 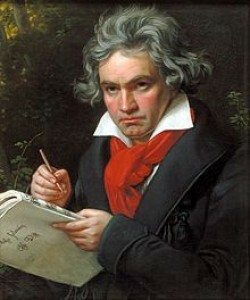 Some time after 1779, Beethoven began his studies with his most important teacher in Bonn, Christian Gottlob Neefe, who was appointed the Court's Organist in that year.Neefe taught Beethoven composition, and by March 1783 had helped him write his first published composition: a set of keyboard variations (WoO 63). 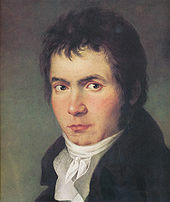 Beethoven soon began working with Neefe as assistant organist, at first unpaid (1781), and then as a paid employee (1784) of the court chapel conducted by the Kapellmeister Andrea Luchesi. His first three piano sonatas, named "Kurfürst" ("Elector") for their dedication to the Elector Maximilian Friedrich (1708–1784), were published in 1783. Maximilian Frederick noticed Beethoven's talent early, and subsidised and encouraged the young man's musical studies. In March 1787 Beethoven travelled to Vienna, possibly at another's expense, for the first time, apparently in the hope of studying with Mozart. The details of their relationship are uncertain, including whether they actually met. Having learned that his mother was ill, Beethoven returned about two weeks after his arrival. His mother died shortly thereafter, and his father lapsed deeper into alcoholism. As a result, Beethoven became responsible for the care of his two younger brothers, and spent the next five years in Bonn. Ludwig van Beethoven: detail of an 1804–05 portrait by Joseph Willibrord Mähler. The complete painting depicts Beethoven with a lyre-guitar. Carl had been ill for some time, and Beethoven spent a small fortune in 1815 on his care. 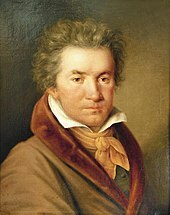 After Carl died on 15 November 1815, Beethoven immediately became embroiled in a protracted legal dispute with Carl's wife Johanna over custody of their son Karl, then nine years old. 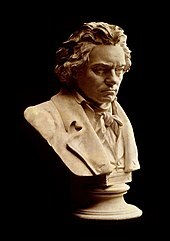 Beethoven, who considered Johanna an unfit parent because of her morals (she had an illegitimate child by a different father before marrying Carl and had been convicted of theft) and financial management, had successfully applied to Carl to have himself named sole guardian of the boy. A late codicil to Carl's will gave him and Johanna joint guardianship. 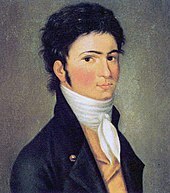 While Beethoven was successful at having his nephew removed from her custody in February 1816, the case was not fully resolved until 1820, and he was frequently preoccupied by the demands of the litigation and seeing to the welfare of Karl, whom he first placed in a private school. 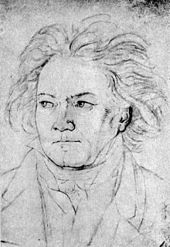 Beethoven's personal life was troubled by his encroaching deafness and irritability brought on by chronic abdominal pain (beginning in his twenties) which led him to contemplate suicide (documented in his Heiligenstadt Testament). Beethoven was often irascible. It has been suggested he had bipolar disorder. Nevertheless, he had a close and devoted circle of friends all his life, thought to have been attracted by his strength of personality. Towards the end of his life, Beethoven's friends competed in their efforts to help him cope with his incapacities.